A Wanted female cadre of CPI(Maoist) outfit Muli Nayak alias Arati (20) surrendered before the Rourkela Police and CRPF on Wednesday. ROURKELA: A Wanted female cadre of CPI(Maoist) outfit Muli Nayak alias Arati (20) surrendered before the Rourkela Police and CRPF on Wednesday.An active cadre of Sundargarh-Deogarh-Sambalpur (SDS) division, she was hiding after escaping from the outfit in December last year. Arati was carrying a reward of `1 lakh on her head. 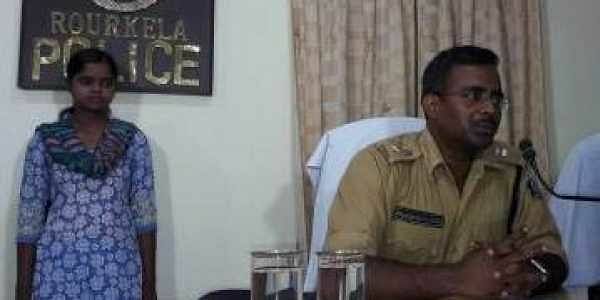 Informing this to mediapersons, Rourkela SP Anirudha Singh said Arati, a native of Bhangaon village under Kiriburu police limits in West Singhbhum district of Jharkhand, was in 2010 forcibly taken away by a Maoist Gunga Munda when she was just 13-year-old. Two other female Maoists of her village had motivated her to join the outfit. She had received arms training at Baliba in Jharkhand for two months and was handling INSAS and .303 rifles. Arati was an active member in the SDS division under the leadership of Anmol Hembram and had been involved in multiple exchanges of fire with Rourkela police at forests of Asurkhol hill, Kelo, Jamdar and a bordering area of Odisha-Jharkhand border. She was also involved in the exchange of fire with Jharkhand police at Bitkelsoy and other Maoist incidents in Angul and Boudh districts of Odisha, the SP claimed. A group of Maoists including Arati had in December 2016 visited her native village Bhangaon when she escaped. Later, Arati was asked to return to the outfit, but she refused and was hiding till she surrendered. Fed up with the hard life in forests, mindless killing of innocent tribal villagers and disillusioned with Maoist ideology, she decided to give up arms and join mainstream. Arati claimed that women cadres are physically harassed and sexually exploited by senior Maoist leaders. In the event of police encounter, women cadres were forced to face police bullets to pave way for safe escape of senior Maoist leaders, she added.